You can't go wrong with this pretty sparkly jacket this season. Jacket features a straight hemline with side slits and long sleeves. Pair it with a solid color skirt or pants to complete the look. 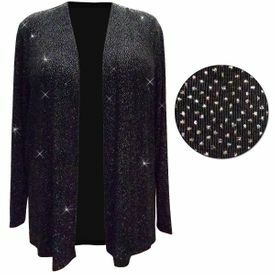 2x - Chest: 56" | Hips: 56" | Length: 31"
Important note about glittery items: It is normal for brand new glittery shirts & dresses to have excess glitter. Care instructions prior to wearing: Sink wash gently, or use a spray water bottle to wet the glittery parts of the dress. Important: put in the dryer under "air only" (no heat) for at least 60 minutes. This should remove most of the excess, repeat if necessary, however there will always be a little bit that "sheds".